THESE LAST YEARS, THE CONFRONTATIONS HAVE GREATLY INCREASED BETWEEN THE CATALAN BOURGEOISIE AND THAT OF THE CONSERVATIVE MARIANO RAJOY. The traditional organisations of the Catalan bourgeoisie, however, are no longer the only protagonists in Catalonia: radicalised sectors of the petit bourgeoisie have joined ‘independentist’ movements. These are formed of organisations of social protest, like the Popular Unity Candidacy (CUP) which contains left-wing nationalists who see themselves as “anti-system” and “anti-capitalists”. They oppose the measures imposed by the Partido Popular (PP) of Rajoy, and the measures advocated by the European Union. The Party of the Catalan bourgeoisie – “Convergence and Union” (Convergencia y UniÓ) – has changed its name. It is now the PDeCAT (Partido Democratico Europeo de Catalunya). This Party is led by Pujol and Mas, ex-presidents of the Catalan government, the Generalitat. As the latter was undermined by corruption, the organisation Esquerra Republicana (Republican Left) was formed, now led Puigdemont and Junqueras, with a vaguely social-democratic programme. Other movements developed as well: the Catalan National Assembly (Asamblea Nacional Catalana (ANC), and Òmnium Cultural. These have a very marked bourgeois-nationalist character. They are all independentist, and none of them objects to any membership of Nato or of the European Union. It is important to note that the Generalitat has attacked the services for public health and education in Catalonia. It has imposed wage cuts and the massive sacking of public employees. It slashed the budgets for social housing and job creation, to ease the debt burden of its corrupt administration. This dispute is not new, but it worsens as the crisis of capitalism deepens. As no side wanted to back down, Madrid sent the State police and soldiers to stop Catalonia holding an independence referendum. This act of repression changed the force relations and the relations in the institutions. This process is accelerated by the PP (Madrid) Government whose responses inflame the confrontations. The left and large sectors of the population view the State’s judicial measures as provocations. 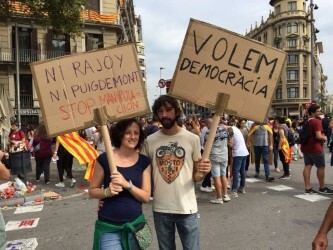 Incensed by the repression, the population and the organisations of the left went to occupy streets and squares in Barcelona, as well as Catalan villages. The Catalan government called for an independence referendum to escalate the fight. Podemos (the left wing political Party) did not support independence but the right of people to decide. Podemos also proposed a change in the country’s territoriality through a Constitutional Amendment. In Catalonia, a sector of Podemos surrendered to the independentists. Some social movements did the same, and so did some ‘Alternative’ trade unions. The workers’ movement did not take position on the matter of independence. The big unions supported the demand for the democratic right to decide and the right to a referendum. There were more workers’ mobilisations than before, although in small sectors: hotel cleaners, home helps, the airport security personnel already in struggle. Following an assembly, the Dockers’ union refused to service the police ships standing in the ports of Barcelona and Tarragona full of officers and trucks ready for intervention or reinforcement in Catalonia. Although with nuances, the Socialist Party took a position of great weakness by supporting the Rajoy government. The conditions existed for the Socialists to propose a no-confidence vote [in the government]. It is Unidos Podemos that called for this, to bring down the government. The Socialist leadership of Pedro Sanchez refused, afraid of being overtaken by the Left and the social movements. Although it offered no clear answers, Izquierda Unida was the only organisation to defend the centralisation of the whole working class. One must value greatly the big Catalan mobilisations and the solidarity which they received from the majority of the Spanish masses who reject the arrogance of the Rajoy government. The crisis of capitalism keeps deepening as the system demonstrates its great impotence and feebleness. If the right-wing is still partly in control in Catalonia, it is purely due to the insufficient maturity of the left. On “Sunday 1-O”, the masses took to the streets in defence of their democratic rights and freedom to hold a referendum. They did this also to reject the policy of the Rajoy government who has only misery, unemployment and loss of rights to offer them. In Catalonia, the PP set out to repress the gathering crowds. It interfered with the voting venues. It tried to stop access to the official electoral register – sole means to validate the results. Early in the morning, the national police penetrated the polling stations, repressed people, confiscated voting urns and disconnected internet links. People did not run away from the situation. They went to vote extra early, defended the polling stations and stood their ground. Following an assembly of their own, the Firemen decided to support and protect the voters, interposing their presence against the repression. 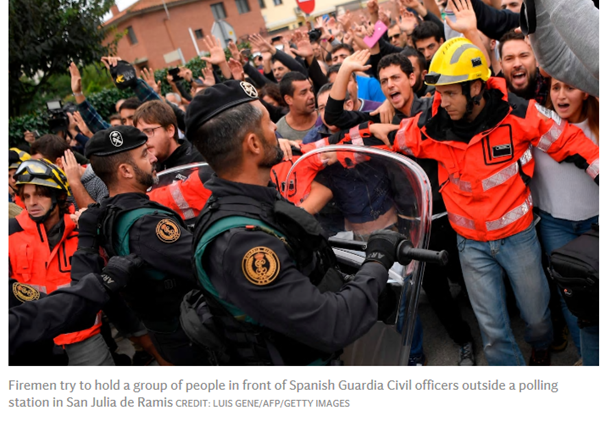 The Mossos de Esquadra themselves clashed with the State police, sometimes coming to blows. People took to the streets with great resolve and stood fearlessly against the repression. One of the cries to be heard was: ‘We are Voting’. Another was: ‘We aren’t Afraid’. In many localities, the Madrid-controlled police forces were expelled. The leadership of the PSOE (Socialist Party) kept drifting politically rightwards. Its right-wing apparatus weighed in the Party more than its militants who were trying to move the Party to the left. On October 3, the Alternative Trade Unions, the Parties of the Left and the Social Movements called a general strike. The latter was well followed in sectors of transport, commerce, the ports and the public administrations, as well as in the small and medium enterprises. The big companies did not shut down because the Workers Commissions and the UGT had called only for partial stoppages. From early morning till late afternoon, millions of people attended. The atmosphere grew steadily tense . The measures taken by the right had heightened the pressure, but this impelled sectors of the left to come out and take part, although they were no independentists themselves. These sectors understood that they could accompany this experience of dual power to press against the right. All the apparatuses and institutions became overwhelmed. One could have called for Catalan Republic. The Rajoy government stepped up the repression. It arrested the presidents of the ANC (Catalonia’s National Assembly) and of Ómnium Cultural (Association based in Barcelona to promote culture and the Catalan language). This intensified reactions that, at the end of October, culminated in the unilateral declaration of independence. This decision was approved by the Catalan parliament, but it did not enjoy the protection of the institutions. The State responded by triggering article 155 of the Constitution, cancelling Catalonia’s autonomy, dissolving its parliament and declaring direct rule from Madrid. The president of Catalonia, Carlos Puigdemont (and four of his collaborator-ministers) decided to travel semi-clandestinely to Brussels to organise their defence from there. This ferocious dispute between two bourgeois camps conceals the intention to hit Catalonia and its social organisations. The experience of the 15M is still alive within these social organisations in the form of social associations and Ayuntamientos del Cambio. Observing the national trend towards greater social transformation, the State aims at the changes in Catalonia. A sector of the population has used this opportunity to intervene and deepen its demands. 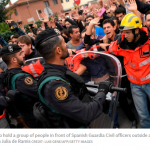 The intransigence of the Rajoy government and its disproportionate use of force reveal its fear of movements that may involve the working class in anti-capitalist perspectives. The class struggle has different forms of expression. To be heard and advance further, the masses use all the cracks and weaknesses which they find in capitalism. It is necessary to discuss in the Left, in the social movements and in the trade unions the need to give a greater programmatic content to this popular uprising which defends social and economic rights, and not just national ones. Note to the reader: you will find J Posadas on Catalonia on the right-hand side of this page, and also in the ‘previously unpublished’ book section of the quatrieme-internationale-posadiste.org, linked to this blog. The Canditatura d’Unitat Popular (CUP) is an independence party in Catalonia and in some Autonomous communities in Spain. The CUP focuses on winning seats in the various local parliaments of Spain (Catalonia and other communities). The Catalan governing body – the Generalitat – contains some Catalan MPs. In 2015, the CUP won 10 MPs out of 135 seats. The CUP speaks of the need for popular participation and for citizen’s assemblies. It poses the right to recall the Catalan MPs. It speaks of Socialism as part of its programme for the self-determination of regions, particularly the Catalan speaking ones. It proposes an Independent Republic for Catalonia. It wants an official status for the Catalan language, on a par with French and Spanish. It defends the idea of the planned economy to produce for human need. It proposes the nationalisation of transport, communications, public utilities and some banks. It does not recognise the Spanish State’s debt, which it deems ‘illegitimate’. It favours the means of referenda to arrive at public decisions. Partido Popular (PP), national Christian-Democratic and Catholic Party under Rajoy. The 1-O referendum – means that it was held on 1st October 2017. A map of proposed autonomous regions. United We Can, i.e. Podemos Unidos: Electoral alliance created on a national scale in 2015 between Podemos, United Left, Equo and various Left parties. Izquierda Unida (IU) is a political coalition formed in 1986 for electoral purposes. It has some 70,000 members. It is mostly composed of the Communist Party of Spain (CPE) – the only cohesive member of IU at national level. The Mossos d’Esquadra are ‘the Squad Lads’. They are a police force of the Spanish State, but they are trained in Catalonia and answer to the Generalitat of Catalonia. As opposed to them, the Policia Nacional and the Guardia Civil are under the direct control of the Interior Ministry in Madrid. The UGT : Unión General de Trabajadores, linked to the Spanish Socialist Party (PSOE). 15M was the anti-austerity movement set up on 15 May 2011 which became called the “Indignados”. Ayuntamientos del Cambio: Mayors for Change. In Zaragoza for instance, the ‘Mayors of the Change’ greatly lessened the public debt. They did this through the financial and economic rationalisation of local administrations, new means of transport and measures to store and recycle resources. This has spread to other cities and Town Halls, in Madrid, Barcelona, etc.